Gourab Ghoshal is Assistant Professor of Physics and Astronomy with joint appointments at the departments of Computer Science and Mathematics. He comes to us from Harvard University, where he was a Research Scientist at the department of Earth and Planetary Sciences and a member of Harvard's multidisciplinary Orgins of Life initiative. Hailing from New Delhi, India, Professor Ghoshal got his bachelor's and master's degree at the University of London, UK (BS and MSc in theoretical Physics, 2004). He did his doctoral-thesis work at the University of Michigan, Ann Arbor (PhD in Physics, 2009) during which he attended the prestigious Complex Systems summer school at the Santa Fe Institute, NM and the Theoretical Physics school at Les Houches near Chamonix in France. Following his PhD, he was a postdoctoral scientist jointly at Northeastern University and Harvard Medical School as well as a visiting scientist at the Media Lab, MIT. 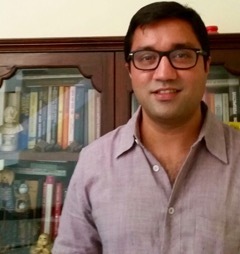 Professor Ghoshal is trained as a Statistical Physicist and works in the field of Complex Systems. His research interests are in the theory and applications of Complex Networks as well as Non-equilibrium Statistical Physics, Game theory, Econophysics, Dynamical Systems and the Origins of Life. He is the editor of a book on Complex Networks (published by Springer) and his work has been published in Nature, Science and Physical Review Letters. Links to his publications can accessed via his Google Scholar Profile.